This year I changed some of my shopping habits. I'm tired of the bigger shopping centres and having to drive round in circles looking for somewhere to park the car. Quite by accident I found a couple of small shopping strips with oodles of parking, but not just that, though the shop fronts are not pretty to look at the goods on sale are first rate. Quite worth having to drive an extra couple of kilometres. One group of shops has a butcher, newsagent and a cafe that makes an excellent latte, and a couple of blocks away there is a fantastic greengrocer. It has a deceptive small shop front but once inside it opens up into a large food hall which runs along behind the other shops. Besides the fruit and vegies it has a large assortment of local products - sourdough bread, biscuits, jams, eggs, yoghurt, olive oil. I do enjoy buying food that has been grown or produced in our local area. 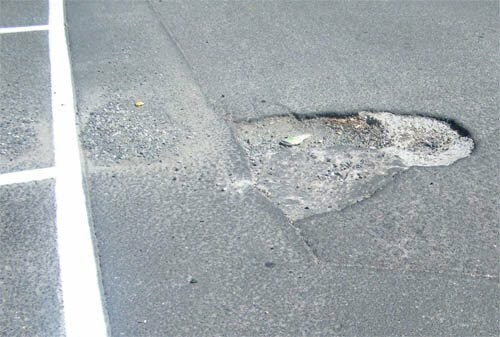 The only fly in the ointment was this pothole, right outside the greengrocer's shop. Surely an accident waiting to happen. It's been there at least three months. I'm happy to record that at long last this week it has been repaired. They did nothing about it until I started to complain. Turned out it was not a Council problem but a private owner's problem. I've never heard so many reasons for not filling in a pothole. Quite pathetic. They say look after the little things and the big things will look after themselves. I'm not sure about that. I helped fix a small problem but I don't think that's going to have any effect on the bigger problem of what a mess the Government is making of things.